That Didn't Take Long ~ The Bucky Channel - The World of Sports from Wisconsin's Perspective. Michael Redd hurt his knee Saturday night, and he'll now be out at least two weeks with an injury to the same knee that keep him out last year. 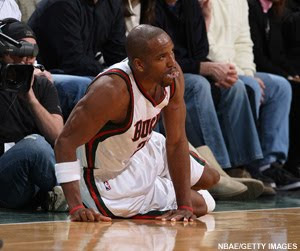 Redd has been a great player for the Bucks, but he really needs to be more healthy to be a help to this team. His leadership, and experience from playing with Sam Cassell, Glenn Robinson, and Ray Allen helps this team a lot. He is really a hard guy to just get rid of, but if he can not play full seasons we are really over paying him. What to do with him is a huge decision this team needs to make by the trade deadline this year. If he can not perform as a 30 minutes a game guy level he is not going to help this team. They are in a rebuilding stage, and can't afford to pay big bucks to a guy that is going to sit on the bench to play half the season. Mr. Redd you have been the main attraction to this team from the day the big three left town. You are a huge reason why this team has not been moved, because of how hard you play the game. I don't really want to say this, but it might be time we go our separate ways.